One large, well proportioned flower on a 140mm inflorescence. Dorsal and ventral sepal apple green; petals and pouch yellow green. 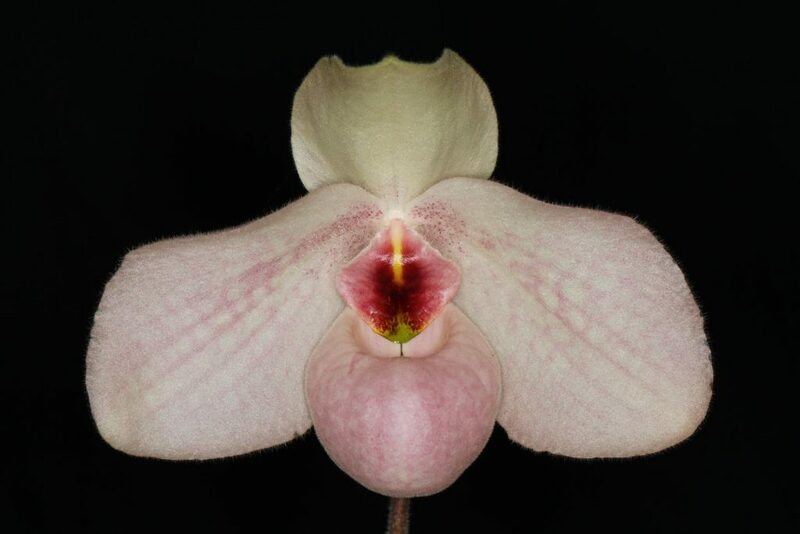 Dorsal sepal slightly cupped, petals flat and full, pouch glossy and lage in proportion. Substance good, texture glossy. Two flowers on a 470mm inflorescence, second flower still opening.Sepals and petals pubescent, well shaped. 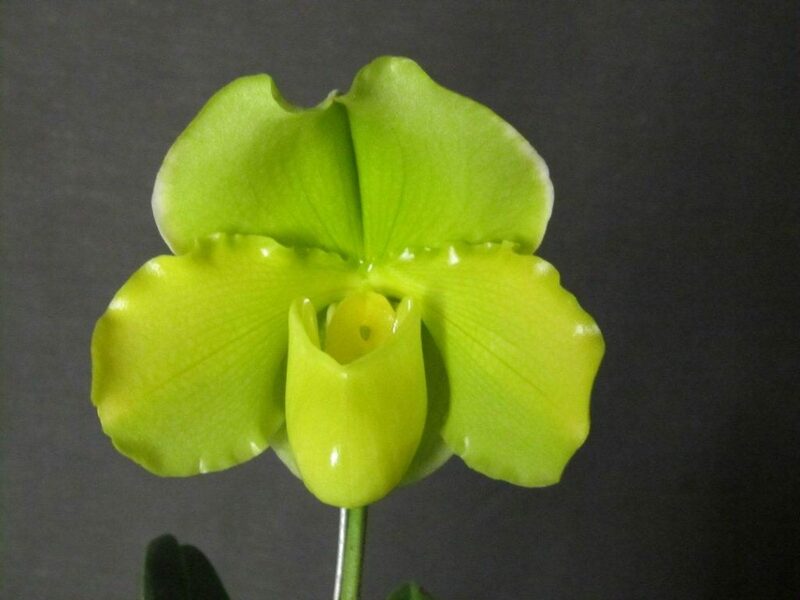 Flat dorsal sepal lime apple green with clear maroon striations; petals yellow green with attractive maroon striations concentrated on the lower base; pouch light cream yellow; staminode light chartreuse heavily overlaid with a maroon splash. Substance heavy, texture matt. Slightly asymmetrical petalls precluded a higher score. One flower on a 150mm inflorescence. Flower creamy white in colour, dark pink tessellations on petals and pouch and pink spots on the inside of the pouch; staminode striking, dark maroon fading to pink distally with yellow stripe at base and green spot at apex. Substance firm, texture matt. 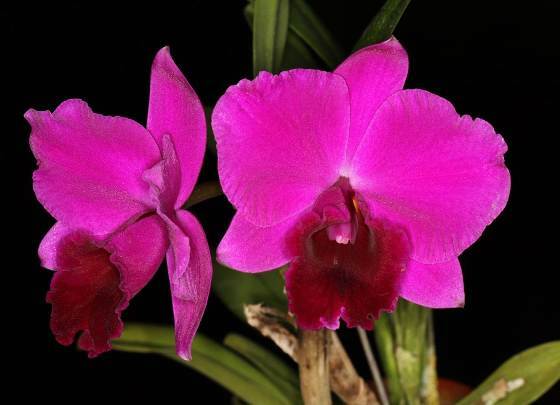 Owners: Van Rooyen Orchids, White River. A 980mm branched panicle, carrying 29 flowers and 24 buds. 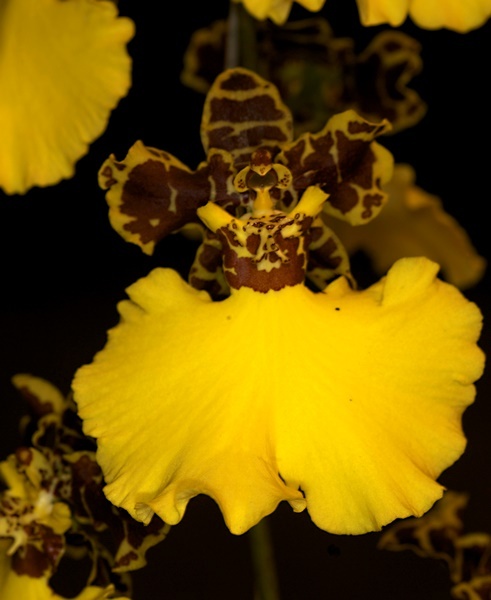 Sepals and petals yellow with chocolate brown markings; labellum very large, solid butter yellow with ruffled margins, the basalpart mottled with red brown markings. Substance thin, texture matte. 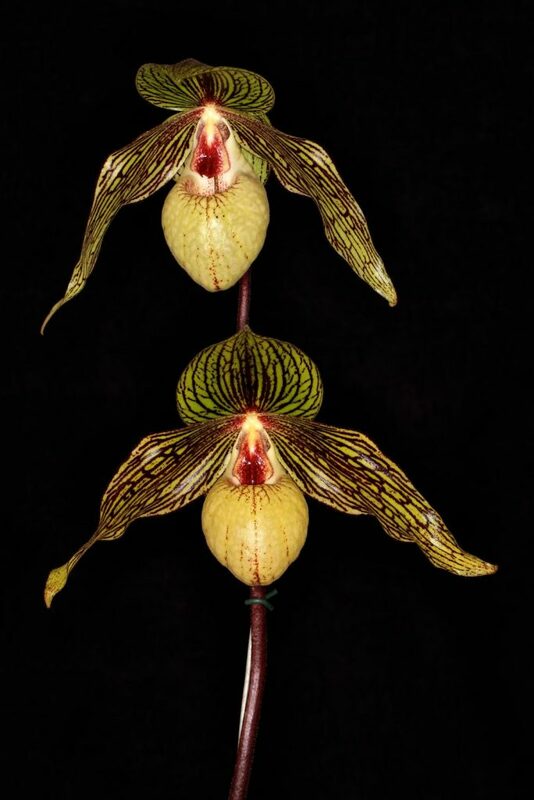 A welll grown mounted plant with 4 inflorescences carrying 331 flowers. Longest inflorescence 1300mm. Sepals and petals deep red-mahogany; lip white with red-mahogany blotch centrally; midlobe and crest light mahogany. Substance crisp, texture matte. One 680mm upright inflorescence with 21 flowers and 10 buds. 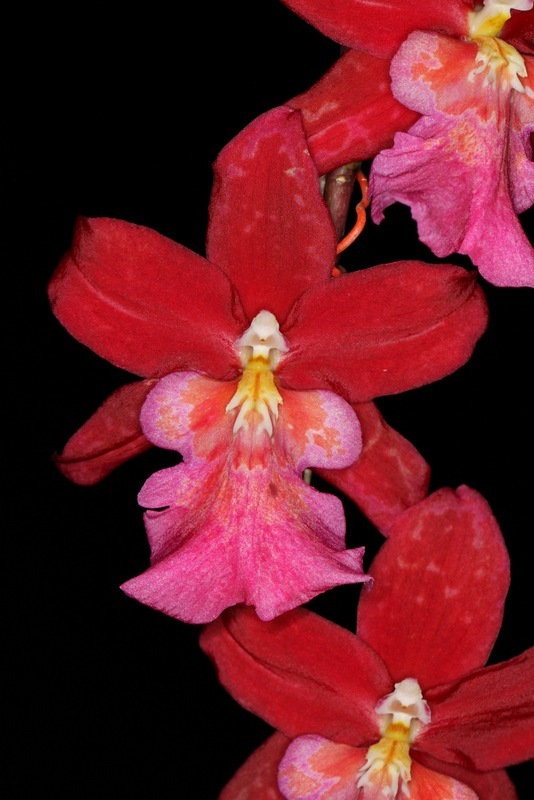 Depals deep red with faint pink blotches towards the apex; petals deep red; lip contrasting pink with light red blotches at base; column and anther cap white. 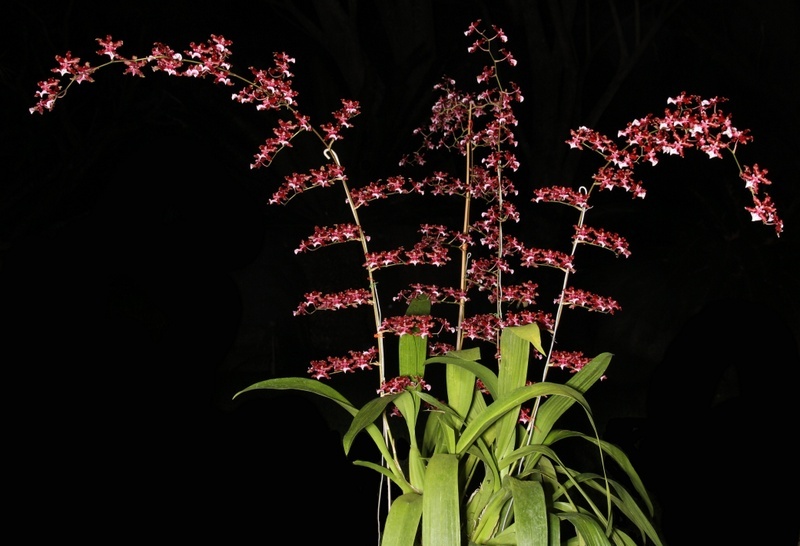 A multibranched inflorescence with 119 well displayed flowers. Flowers yellow980mm branched panicle, carrying 29 flowers and 24 buds. 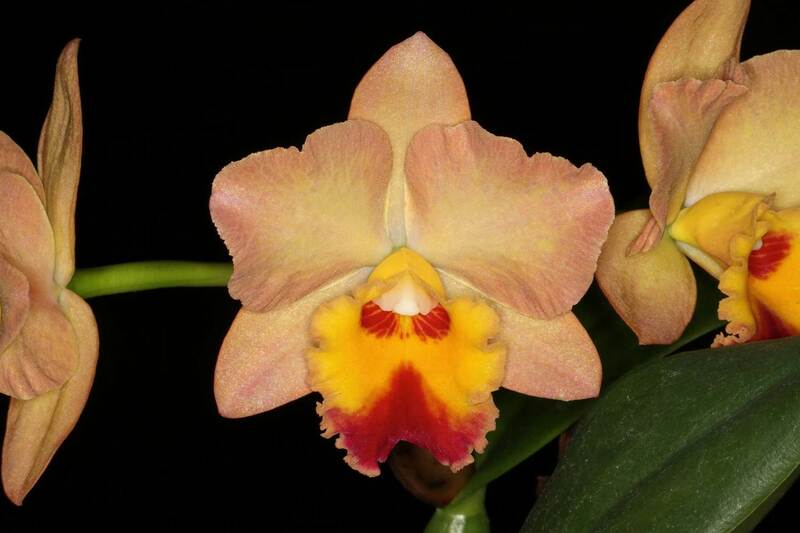 Sepals and petals yellow with chocolate brown markings; labellum very large, solid butter yellow with ruffled margins, the basalpart mottled with red brown markings. Substance thin, texture matte. carrying 29 flowers and 24 buds. Sepals and petals yellow with chocolate brown markings; labellum very large, solid butter yellow with ruffled margins, the basalpart mottled with red brown markings. Substance thin, texture matte. 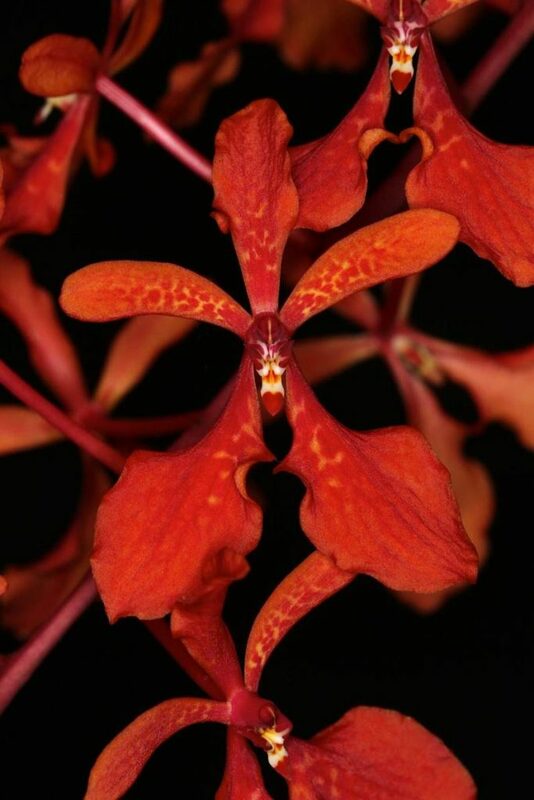 A 50mm inflorescence carrying 2 flowers. Flowers deep magenta with contrasting wine red lip; anther cap a contrasting light rose pink. Substance average, texture sparkling.